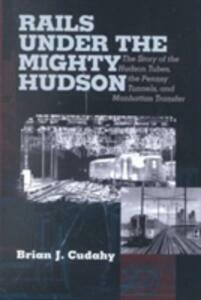 Rails Under the Mighty Hudson tells a story that begins in the final years of the nineteenth century and reaches fulfillment in the first decade of the twentieth: namely, the building of rail tunnels under the Hudson River linking New Jersey and New York. These tunnels remain in service today-although one is temporarily out of service since its Manhattan terminal was under the World Trade Center-and are the only rail crossings of the Hudson in the metropolitan area. Two of the tunnels were built by the Hudson and Manhattan Railroad, a company headed by William Gibbs McAdoo, a man who later served as U.S. Secretary of the Treasury and even mounted a campaign for the Democratic presidential nomination at one point. McAdoo's H&M remains in service today as the PATH System of the Port Authority of New York and New Jersey. The other tunnel was opened in 1910 by the Pennsylvania Railroad, led to the magnificent Penn Station on Eighth Avenue and 33rd Street, and remains in daily service today for both Amtrak and New Jersey Transit. The author has updated this new edition with additional photographs, a concluding chapter on recent developments, and a Preface that recounts the last trains of September to the World Trade Center Terminal.